In some patients with moderate-to-severe asthma patients treated with long-acting beta-agonists and medium-to-high doses of inhaled glucocorticoids, tezepelumab treatment resulted in lower rates of clinically significant asthma exacerbations as compared to those who received placebo, independent of baseline blood eosinophil counts, researchers reported. This trial evaluated the efficacy and safety of tezepelumab, which is a human monoclonal antibody specific for the epithelial-cell-derived cytokine thymic stromal lymphopoietin (TSLP). TSLP is produced in response to environmental and pro-inflammatory stimuli, more so in the airways of patients with asthma. Tezepelumab binds to TSLP and prevents its action . 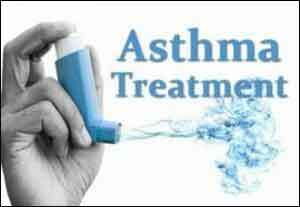 In this PATHWAY study patients with moderate-to-severe asthma whose disease was uncontrolled with long-acting beta-agonists and medium-to-high doses of inhaled glucocorticoids were selected and enrolled. The researchers assigned 148 patients to receive placebo in addition to their current medication; 145 patients were assigned to various doses of tezepelumab. In this phase 2, randomized, double-blind, placebo-controlled trial, Jonathan Corren et.al .compared subcutaneous tezepelumab at three dose levels with placebo over a 52-week treatment period. The primary end point was the annualized rate of asthma exacerbations (events per patient-year) at week 52. It was concluded that patients regardless of blood eosinophil counts at enrollment, the prebronchodilator forced expiratory volume in 1 second at week 52 was higher in all tezepelumab groups than in the placebo group (difference, 0.12 liters with the low dose [P=0.01], 0.11 liters with the medium dose [P=0.02], and 0.15 liters with the high dose [P=0.002]). A total of 2 patients in the medium-dose group, 3 in the high-dose group, and 1 in the placebo group discontinued the trial regimen because of adverse events. Among patients treated with long-acting beta-agonists and medium-to-high doses of inhaled glucocorticoids, those who received tezepelumab had lower rates of clinically significant asthma exacerbations than those who received placebo, independent of baseline blood eosinophil counts.